The suitably named Casa Preto Velho in Salvador’s notorious market Feira de Sao Joaquim, specialises in religious articles for various faiths practiced in and around Bahia, including Catholicism, Umbanda and Candomble. ‘Casa’ in this case means shop, whilst the meaning of “Preto Velho” is much much spiritual. 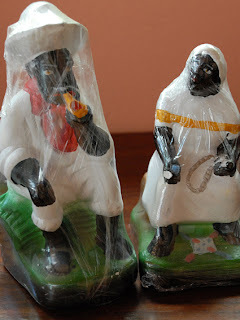 According to our friend Sabrina, “Pretos Velhos are Umbanda spirits of former slaves who managed to live to a ripe old age (unlike most) and represent wisdom, benevolence, faith and humility. Umbanda is a uniquely Brazilian religion that combines African divinities (orixás), Spiritism, a variety of Afro-Brazilian and European spirits and Amerindian Caboclos”. Similarly Candomble is a popular Afro-Brazilian religion, and is worshipped by millions of Brazilians with Bahia being its hot-bed. Statuettes (like the Preto Velho and Preta Velha pictured above) are part of one of the largest selections of ceremonial regalia in the city, so it’s a really important and busy place. The store is packed to the rafters with statuettes of all sizes of all the ‘spirits of devotion’ as well as clothing, crockery, candles, beading, incense, herbs, statuettes, drums, DVDs and literature. In the build-up to photographing the store’s customers, we were speaking with a Candomble family, when something rarely seen and powerful happened. A daughter in the family was temporarily possessed by her spirit of devotion.